Rachel told us that one of the most important skills a good technician will have is "puzzle solving skills." For example, if she gets a flute in the shop, she will normally have information to some degree about problems with the instrument, but she will need to determine what exactly is causing the problem and how to fix it, which she says can be "like solving a puzzle." She shared that in addition to the procedures she has learned in school and the gauges she uses to check her work, it all boils down to the "feel, look, and sound" of the instrument. The "feel" is particularly important, and it is an acquired skill that takes time to develop. She said it is important to be able to feel how the flute is working. She will need to feel where a problem might be and also feel when everything is finally working properly. 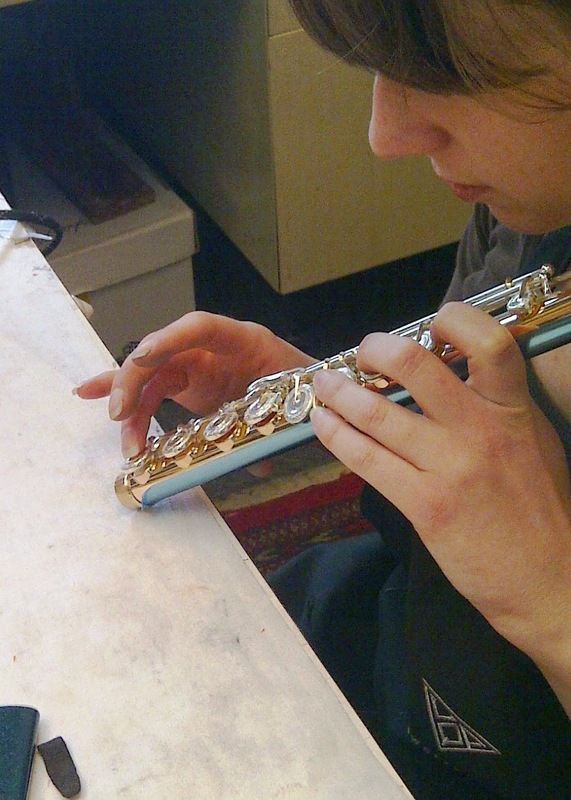 Another example she shared is that she repadded a flute, and when she was finished, she checked the mechanism but could feel that something wasn't quite right with one particular pad. Her gauges showed that the pad was seated correctly, but she could still feel that the way the pad was hitting the cup was different, and she could also hear a difference when the key closed. Come to find out, there was not a problem with the pad -- it was actually the tone hole! The tone hole was leaking where it was attached to the body and needed to be resoldered. As we can see, it really can be like solving a puzzle -- and the technician's acute senses are critical for diagnosing and repairing problems.